I really don't think I was useful this week. Normally I am very excited on Sunday night for the upcoming work week ahead, and this Sunday I just wanted to stay home. Too much to do, and Christmas is almost here. The weather is cold outside and the house is warm. There are presents that need to be wrapped and small gifts left to buy. Laundry that needs to be washed and folded. I found myself thinking about the things I needed to do at home while at work, and not wanting to actually work. People still want their cabinets made by Christmas. Every year with the exception of the last two, most of our clients want their cabinets by Christmas. This makes for a very stressful month. I am working on a new system I implemented where I schedule each install by the date and not by who calls the most. It is the running joke around the shop that if you tell my dad, "I'm not in a hurry to get my cabinets," your going to wait awhile. And if you call all the time and are a pest you get in the front of the line. That is why I am changing the system. So many things to be thankful for this year. My two healthy and happy boys this morning, getting into mine and Greg's bed. 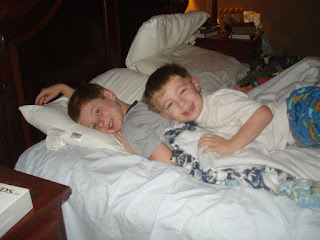 They are so sweet when I think about how they wake me up every morning, (just me, nevermind that they walk all the way aroud the room to my side of the bed), and ask, "can we watch cartoons mommy?" No matter how much I tell them that they don't have to ask me to watch cartoons, inevitably I will not be sleeping in past 6am ever again. Nevertheless those moments I will always treasure in my heart and memory. I cannot stop wondering about Grandma and thinking about what she is doing now in heaven. I am missing her terribly. I think about how it will be a void without her at the table this Christmas and how different it was at Thanksgiving. I mainly think about when each of my boys were born, and how she came over to the house and held them close rocking them like all grandmothers do. Making sure the blanket was just so, and looking at them intently. That is a precious memory that I will always have. I will never forget her holding me as a child in the rocking chair and reading to me. Letting me hold her soft hand and listening to all the wonderful stories from all the books she had. I am forever grateful for her love and kindness. My husband Greg, who loves our sons and does the important things like, buying halloween costumes, and making sure the boys aren't wearing anything remotely like last years costumes. I will always admire him for keeping it fresh, and always thinking of others before himself. I can only see him with me and I hope he can only see me with him, we fit together perfectly but in an imperfect way. I will always love him. 2010 sounds terrifying to me and exciting all at once. I have to write my vision of the future a year from now, and it will be here before I know it. I think 2010 will be a better year for the cabinet shop. I think work will be steady and we will work steadfast. I think God has a lot in store for me to learn and accomplish. All I really know is that if God is lifted up and praised because of what goes on in my life or what happens to me, then it is all for the good. My personal relationship with Jesus is going to grow and I will learn more about him this year. If I can have a closer relationship with Him and show others his love for them, all will work out just fine. I am so not tough, although I would like to think I am. I do not take criticism very well especially when someone is swearing and yelling at me. Today didn't turn out to be one of the best days because I got a bad phone call from a customer that I cannot please, and my time is up. There are no more chances, and that makes me want to cry. I have been given enough time to complete my task and that is it. I think it makes me want to cry because I have been given a second chance by Jesus. I am forgiven and because of that I need to forgive others too. So when I am not forgiven by people I resort to crying, and being in a "male dominated" occupation with a "male" swearing at me I find myself secluded and attacked. I don't like being attacked and I don't like being told my work is crappy when I know it is not. I will only be sad today, just today I will go home tonight play with my cute boys and drink a warm cup of coffee, (maybe with some whipped cream). Better yet I'll make myself a mocha! Tomorrow is another day, and its definately going to be better. Quoting a job especially a kitchen is a lot of work. Right now I am still in training learning how to measure cabinet spaces and the thing I am most afraid of is measuring wrong. Now that I think about it, my absolute worst fear is that I measure the space, build the cabinetry, and it doesn't fit. That would cause me to feel like a complete failure and I do not like to fail. Although my standard is if I do fail then I will make it right by trying again, and figuring out what I did wrong. For example, this picture of a job I quoted last week took me a day and a half to complete. I got the quote to the client in one day, and followed up the day after with no response. My dillema is how soon and how much more time do I invest? Do I call again? Does the client not want to talk to me? I am not sure and I'm not very good at discerning these types of things. I usually wait and hope for the best. Which means I'll forget about the job, move on and probably never get it. I think this is causing me to lose jobs instead of gain, and I am not quite sure how much is too much. I do not, I mean DO NOT want to be that pushy girl who calls and calls, and drive the client crazy, but on the other hand I don't want to be too flippant and the client thinks I am not interested in the work. There is a fine line of how far you need to go for work and how much time you need to invest before you decide whether or not to back off. Yesterday was so much fun, with turkey and stuffing and all that good food. Here are my two boys and my nephew in the middle, Jackson. All up to something yesterday. It was a nice, quiet relaxing day, with no phones ringing, no disgruntled employees, no bills to worry about, no cabinets to build. All in all it was a great day. I looked forward to taking my boys out this morning for a trip to a friends new house which they are remodeling. What a great house, with so much potential! They want us to build them two different vanities for each bathroom and I brought Nathan and Jakob out there to play with their kids while me and my dad measured the spaces for the vanities. Well, my dad measured while I kept my eye on the boys (you never know), and I asked questions when I could. Another outing learning with my dad is nice to spend time with him and also to let me be more prepared to go on my own. I am going to be measuring more now, and I am definitely up for the challenge. There is a lot to think about and I have been in the cabinet trade now full time for 6 years and I still don't know a lot. But, each year I learn about 20 new things which I love. You will see me talk a lot about wanting to go out into the shop and assemble cabinets and that is something I am really begging to do right now. I am always in the office and I have to a least know how the cabinets are built, which I do but I need to physically go out into the shop for myself and do it in order to create more credibility. As you read a few days ago the "male shovinists" are alive and well and coming into my office! This is just another way for me to prove myself although I shouldn't have to, but because I live in the "Real World" I am going to. I think I will first talk about the wonderful visit by my 3 year old just a few minutes ago. Nathan walks in the office with his ice cream cone he got from Grandma and laughs when I say, "Is that mine?" He is so cute, and sweet. When he leaves and I buckle him into his car seat he says, "Mommy I need a kiss and a hug." I just smile and realize there are only a few more precious moments like these, and there will be many new and different experiences to come. I just want to freeze this time in my life just a little longer, it slips away so fast. I just love the little hands, and the little toes, and the "Mommy help me!" Even when I am tired or lazy I know in the back of my mind that this "needing" of me will soon end. On to bigger and better things, they all say. I hope that all of these memories will stay in my heart forever. As for working today, I think I am ready for a vacation. I am excited about the jobs we are finishing and the jobs I am quoting, but I know Thanksgiving is in just 3 days and it makes me so excited and anxious because I have a lot of shopping and planning to do. My Jakob's birthday is on Thanksgiving this year and that is another thing I need to get ready as well. I still have to set up his Chuck E Cheese birthday party for the following weekend and I get Greg, "Mr. know it all" asking me, "did you set that up yet?" Like I don't go to work too. I love to be the person in charge of groceries, laundry, parties, date nights, setting up babysitters, buying birthday gifts, picking up children from daycare, taking children to daycare, helping with homework, making dinner every night, giving baths, putting kids to bed, cleaning the house, going through the mail, paying bills, and oh that full time job thing too! Sure Greg, I have time to set up the party too! According to him he has the hardest job in the world and I assume right this very second he is laughing it up with all of his UPS buddies eating lunch at California Pizza Kitchen. It must be hard being him! I am always learning something new and I love to learn new things, and this year is no exception. I learned earlier this year that there are career coaches. Coaches that help you with anything you might need advice in for your business or even your personal life. I wish I had known of this coaching before, but I am glad I do now. I just finished my first six month coaching period with Lynn Telford Sahl and you can look her up on www.lynntelfordsahl.com. She has helped me grow in the last six months, giving me a different perspective on situations I have faced and am currently going through. I have found this coaching truly helpful and valuable for me and my business. I am now in a year long coaching program called the "Big Fish" program. If you go to www.bigfishnation.com you can learn all about it. This is a unique coaching program which has homework for me to do and books to read so that I can learn how to be a "Big Fish." I am so excited for what is ahead, and I have already learned so much. I have learned that you "only give energy to that which you want to grow." I also am excited that I started reading, "Write it Down, Make it Happen." I plan on writing down, "Weber's Cabinets will sell hundreds of butcher blocks throughout the entire country from our website." I am sooooo Excited! Great, now I can't get that stupid song out of my head. Grandma Weber passed away just 3 weeks ago on October 22, 2009. She was 90 years old, and she was the most loving and patient woman I have ever met. She decided to take the risk of having heart surgury to possibly extend her life, but pneumonia took over her body and she lost her life. I am so hopeful of where she is now, with Jesus in heaven. She is in a better place than I, and I am hopeful that I will someday see her again. I will get to hold those soft hands that she had, give her a hug, and maybe paint a picture with her. She really loved my boys as you can see, and this picture was taken last year in my house when she came over for dinner. She let them sit on her walker and they giggled and laughed because the walker was a fun thing for them to move around. Thinking for years that it wouldn't be so bad when my grandma died because she got to live a long life. It really doesn't matter how old the person is when they die, I have found it all hurts just the same. Would you buy a Custom Made Butcher Block? Would you buy a custom butcher block shaped like a wine bottle? Please send in your answers. On the very top is a chopping block made with cherry and maple lumber that we at Weber's Cabinets are currently making. I went out into the shop to take pictures of it in progress. As you can see it is clamped up because the glue is still drying. I thought it might be a good idea to make an end grain chopping block into the shape of a wine bottle. Lodi California happens to be the heart of wine country and we have a lot of wineries in our small town. We also have a lot of tourists, and I thought we might sell these chopping blocks to the local wineries for them to sell as gifts. The second picture down is a prototype of a chopping block made with end grain and solid lumber that is your everyday square style. These are beautiful blocks for use of cutting vegetables, cheese, fruits, and many other items. They are also good for display. Check out our website at http://www.weberscabinets.com/ for these items and more on sale soon. I came into the office today with great excitement! I sold two of our butcher blocks to a wonderful friend who owns the best coffee shop ever, and I got an email from a person who showcases custom builders on their website. They want to show my dad's blog http://www.askthecabinetmaker.com and they say as many as 4000 visitors will come to our site per month. I am so excited while driving to work and then skeptical. I think well, how much will this cost? I really want to look into it, because selling our custom cabinets excites me, and selling these special chopping blocks online makes it a new and different experience. I am working here at my dad's desk this morning, because I had to update my client list and production schedule. It sounds too formal and yet it is anything but. The phone is ringing, people want to sell me things, talk to me, and they come in to visit. These are all distractions on a typical Monday. After my husband Greg came home from his trip to Dallas, Texas he of course brought back lots of Cowboy stuff. I really want to say "crap" because he actually brings back the plastic cups that you get at the stadium when you order a drink. He even goes down the aisle after the game and picks up cups that others left, "yuck." So when he got home the boys wanted to see all of the things he brought home for them. These are "special band aids" that they put under their eyes like the cowboy players would do with that black paint stuff. Jakob is almost 6 now and he has a little personality going, maybe he's playing the part. I don't know how he would even know how to do that. Nathan on the other hand is still my cute little guy with the great smile. They are both wearing their new cowboy hats too. For certain, this family will never be with out Dallas Cowboy paraphernalia EVER! Working in the office and for my dad has its perks. I get to pick up my son from school and bring him back with me to work. He loves to ask me questions while I'm on the phone with clients, and loves to pat my arm until he gets my attention while I'm on the computer. Today I have him doing homework before he can get on the computer. He looks so studious! I have about a million things to do on my list, and I haven't checked them all off yet today. But one of them was to start this blog. I am looking forward to updating you with my perspective of working at Weber's Cabinets.